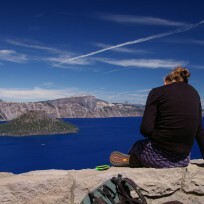 While it had not been Cheryl Strayed’s original intention to conclude her PCT pilgrimage at the Bridge of the Gods over the Columbia River, in the end she was drawn there. Cheryl had toiled more than 1,100 miles to reach the bridge, but while her physical journey was miraculously and safely over, and she’d relinquished much baggage, her understanding of it all was still taking shape. On that September day in 1995, Cheryl didn’t cross the bridge, she just touched it and looked through its grate at the rushing river beneath. Much of the meaning of her adventure would take years for her to unravel. But eventually she would return to cross the Bridge of the Gods as part of a new beginning, rather than an ending. But you’ll have to read the book (or see the movie) for that conclusion. 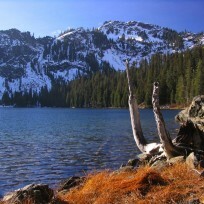 Visit at least these two unique PCT destinations on your stay in Cascade Locks and the gorge. 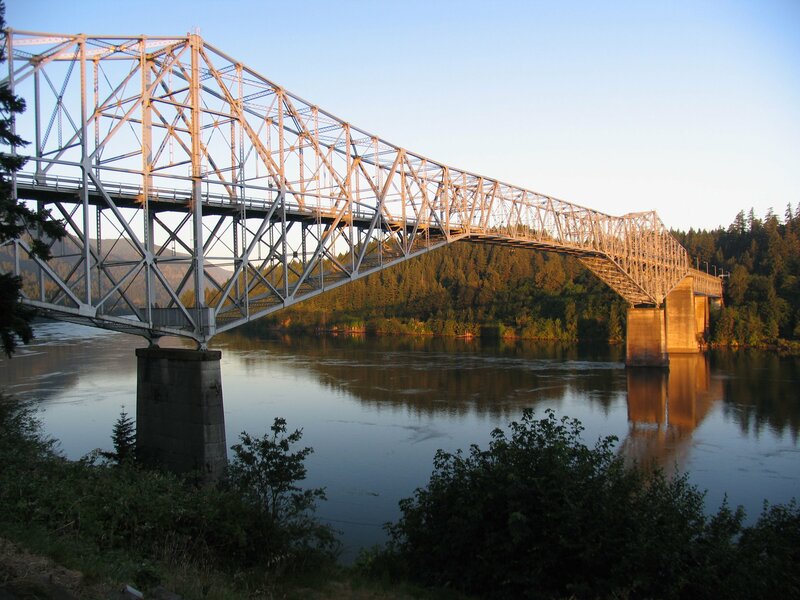 In the heart of the Columbia River Gorge, hub of world-class hiking and bicycling, the Bridge of the Gods sits at the convergence of The Historic Columbia River Highway State Trail, three National Historic Trails, and the Pacific Crest Trail. It’s a really unique stretch of trail. Walk across the narrow bridge – beware there is no shoulder and you share space with cars and trucks – it’s the official PCT. Your stare will be drawn down through the metal grates and to the river below. Remember to look up and around at the beautiful Gorge and savor the fact that you’re at the state line and the lowest point on the Pacific Crest Trail. Next, hit trail tread on the nearby Eagle Creek Trail. 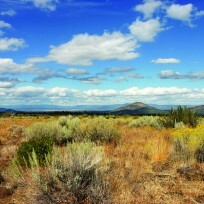 It’s deservedly one of Oregon’s most popular spots for day hikers and backpackers alike. 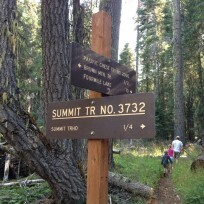 It is also an easy side trip and alternate route for PCT hikers traveling between Mount Hood and the Columbia River Gorge. 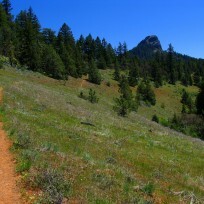 The Eagle Creek Trail is not, however, accessible to horses—one of the reasons it was not made part of the PCT’s official route. 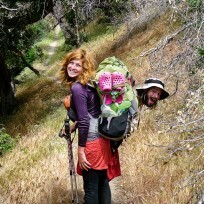 Still, we highly recommend walking this stretch of unofficial PCT! Punchbowl Falls off the Eagle Creek Trail near the Washington-Oregon border. Unusually dramatic, the Eagle Creek Trail is not for the faint-hearted as it is a precariously exposed path that, in places, had to be blasted into the cliff. The trail follows Eagle Creek as it feeds into the Columbia River, passing rock-bound washes, clear deep pools, a two-stage 100-foot waterfall, and Tunnel Falls—where the trail actually passes behind the thundering cascade. Then, as an encore, Eagle Creek treats you to an 80-foot fall and the Punch Bowl, a huge pool with a sapphire hue fed by a boisterous, 40-foot plunge. While you can’t expect to experience solitude on this popular PCT alternate route, you can expect to be awed—and that’s well worth a little company. 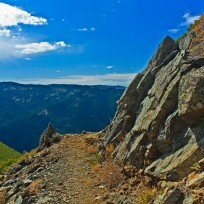 Distance: Walk out and back on these stretches of the PCT. It’s 3.8 miles roundtrip to Punchbowl Falls from the Eagle Creek Trailhead. The Eagle Creek Trailhead is off Interstate 84, at exit 41. At the bottom of the ramp turn right. Go about 0.5 mile to the end of the road. To reach the Bridge of the Gods, take exit 44 off of Interstate 84. Follow the signs to the bridge and Stevenson, Washington. Permits: No permits are required but a Northwest Forest Pass is needed for parking at the Eagle Creek Trail (you can purchase it at the trailhead). Special regulations: Dogs are allowed on leash but it’s not recommended. Steep drop offs on the Eagle Creek Trail pose a hazard. Traffic on the Bridge of the Gods is also a definite concern.